Actually, not just one, because I bet you weren't expecting it to be that one, were you? Turns out Edward Burne-Jones did a whole bevy of annunciations of all shapes and sizes. This is possibly his earliest, from 1857, like a dark stained-glass window. The faces really stand out but otherwise things are confused as both Mary and the Angel seem to blend with the nature around them. 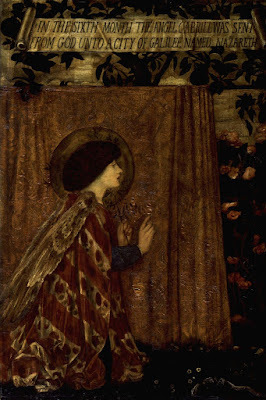 Back to the dark palette, Burne-Jones created a triptych, with beautiful ivory figures in delicate, dark bronze drapery. I love the little silver tips on the wings, although the halo looks a little like she's wearing a space helmet. I've never thought about halos in depth before. Are they made of light, like something illuminating? Or is it acceptable that they are made like glass, like a prism? Burne-Jones' 1861 angel's halo seems to distort the drape behind it, like you are looking through someone else's glasses. Okay, so here we are at the most famous of Burne-Jones' annunciations. I wrote about this painting and the reaction to it here, and it is the most surprisingly controversial painting I have ever seen. It's so pale and beige-y you wouldn't guess critics would get so excited about toes, and yet there is no accounting for weirdness of people. 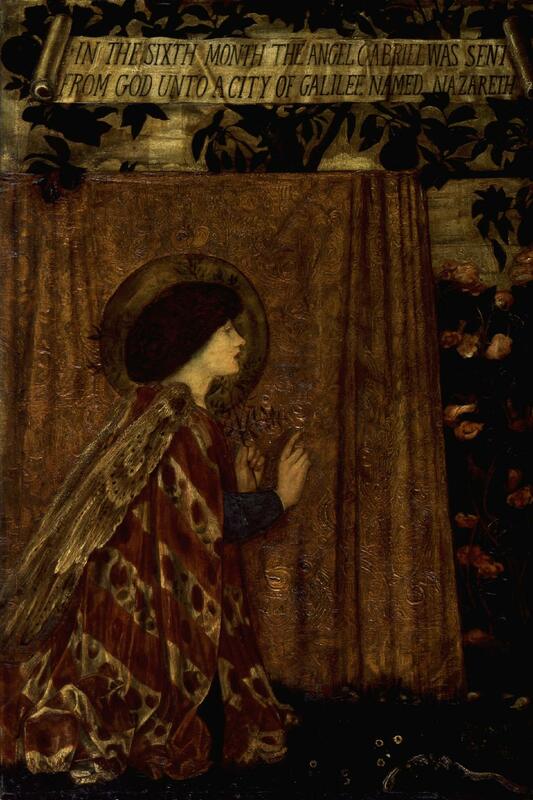 So why did Burne-Jones return to the subject over and over again? I wonder if there is any connection between how young Georgiana Burne-Jones was when they married and how much he felt she was changed by having their children. The Virgin Mary certainly had her life altered (and not always for the best) by having her child when she was arguably far too young and innocent to be expected to cope with the responsibility of a normal child, let alone a holy one. 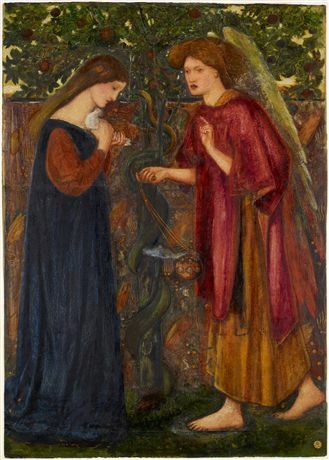 Yet that's how it all happened, so maybe there is Burne-Jones' own residual anxiety at the sudden pressures of adulthood in his timorous Virgins. Twelve years ago I was in labour (32 hours, thank you for asking) and I have to admit no-one ever really feels ready to be a parent because the responsibility is too huge to comprehend by any sane person. And that's without lobbing an angel in to the mix. All you can do is hope you are a kind enough person to raise a kind person. The rest will sort itself out. Thanks for linking to your previous post, which I greatly enjoyed.